You can start job manually, for example, if you want to create an additional restore point for a VM backup or replica and do not want to change the job schedule. You can also stop a job, for example, if VM processing is about to take long, and you do not want the job to produce workload on the production environment during business hours. In the working area, select the backup job and click Start on the ribbon or right-click the job and select Start. Stop job immediately. 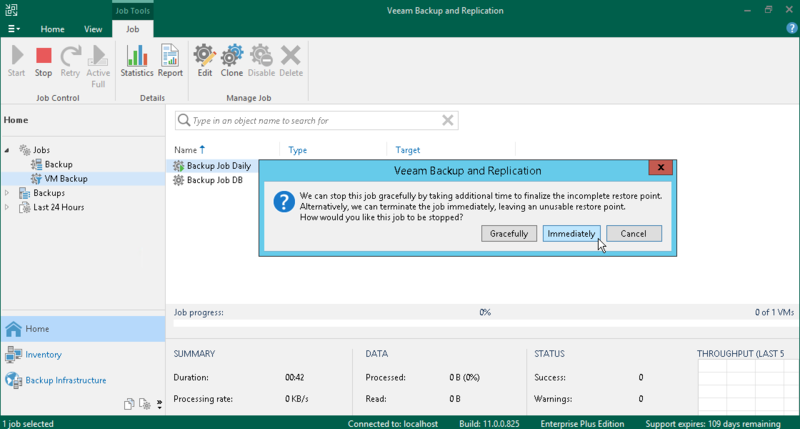 In this case, Veeam Backup & Replication will produce a new restore point only for those VMs that have already been processed by the time you stop the job. Stop job after current VM. In this case, Veeam Backup & Replication will produce a new restore point only for those VMs that have already been processed and for VMs that are being processed at the moment. In the working area, select the backup job and click Stop on the ribbon or right-click the job and select Stop. In the displayed window, click Immediately. In the working area, right-click the job and select Stop. In the displayed window, click Gracefully.